24 1/4 inches overall length, 15 inch blade. Handle is hard maple, fittings are wrought iron, and the blade is w1 with a pattern-welded strip of 1084/15n20. Sheath buttons cast by Thorkil. I'll be shipping her off tomorrow to her new owner. 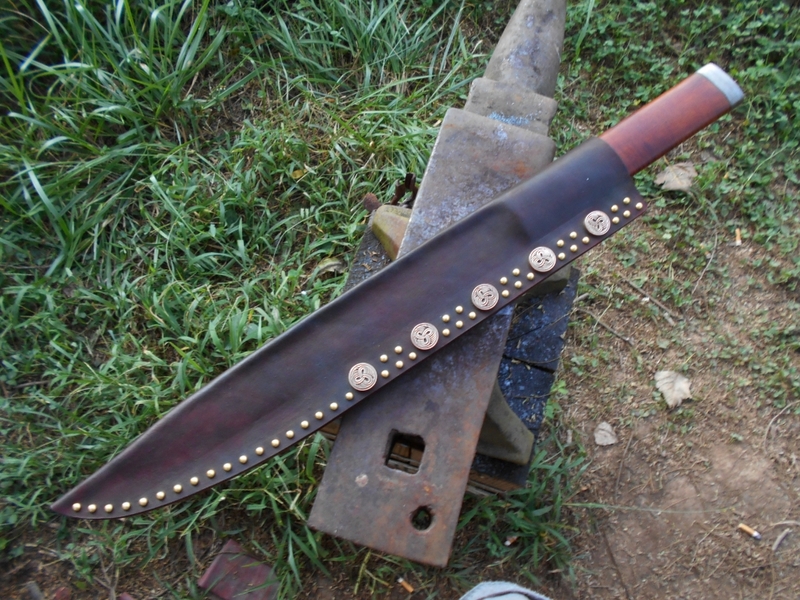 That seax looks amazing i love the shape and size of this thing what an beast your workmanship is simply stunning. Hello George, this is very very nice. What is the significance or meaning of the runes? 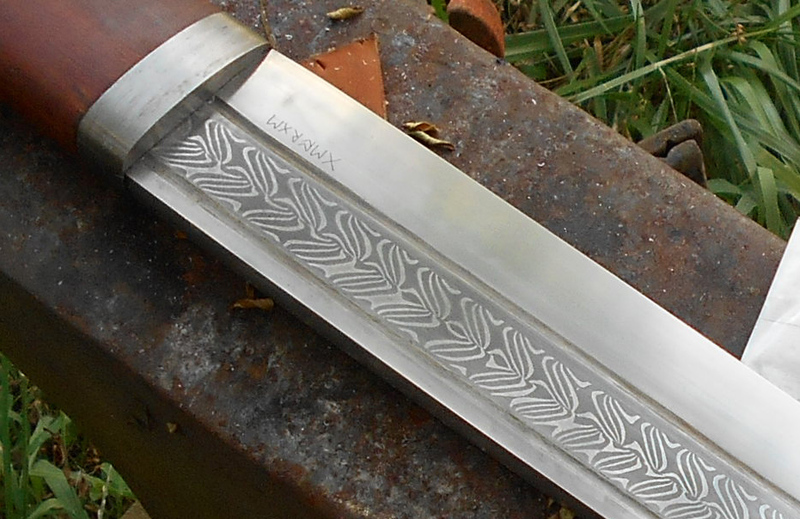 The pattern contained within a boundary within the blade is really well done. I would think that was hard. WOW!!! That is really, really nice! I am really glad you have gotten into seaxes! I love your work and it's nice to see you doing pieces that are so close to my interests...Any chance for an in hand photo for a bit of scale? In the elder FUTHARK: GEARGE, it would be a phonetic spelling of his first name. I really like this seas. What date are you shooting for here? Is it common to see runic non-inlaid inscriptions of the period you are drawing from. The blade and hilt are beautiful. Tim, sorry there are no in hand shots, this one is already headed to its new home. I was somewhat concerned the almost 2 inch wide handle would be uncomfortable, but it feels similar to a good axe in hand. Too bad you couldn't get some in hand shots. Perhaps the new owner will be kind enough to take some. 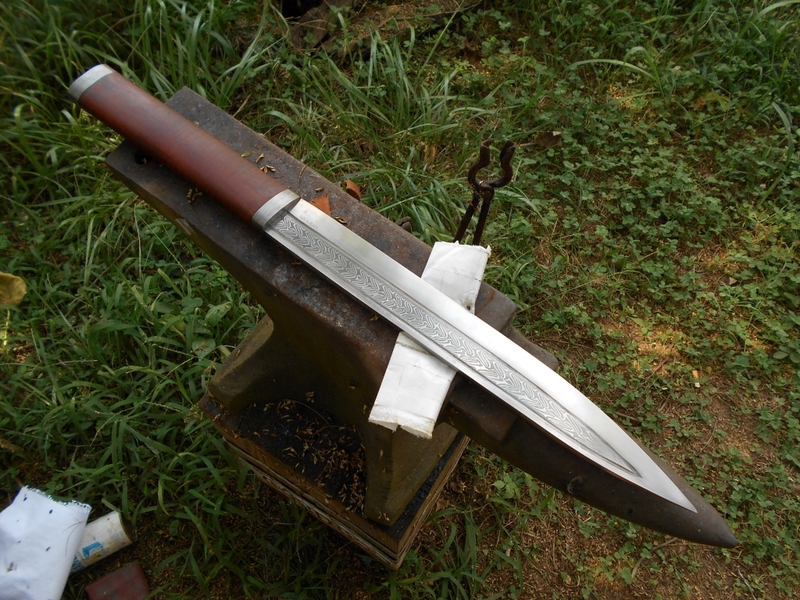 Again, this seax is really, really nice. I just love it! I really like it too, well done - All of it. The 'fuller boundary' (is there a better name for it?) is very nice & also adds a bit of organic feel (good). Thank you for sharing.